Yellow Ridged Toucan (Ramphastos vitellinus culminatus) is very similar in coloration to the Cuvier’s Toucan, but smaller in size. It is distinguishable at a distance only by its croaking call, which contrasts with the Cuvier’s loud, yelping call. It ranges from southern Venezuela south along the eastern Andes into Colombia, Ecuador, Brasil and Peru and into central and western Bolivia. Currently there are no Yellow Ridged Toucans in captivity in the USA. There are a number of captive Yellow Ridged in Peru, where they are being bred and where this bird is also quite common in the wild. 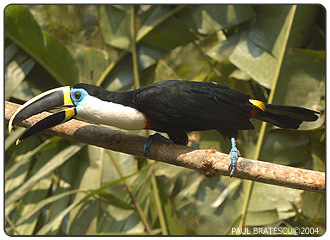 The Yellow Ridged Toucan is a subspecies of the Channel Bill(Ramphastos vitellinus) and for that reason it is listed on Appendix II of CITES.